49 people bought this item recently. Today’s lifestyle and diet doesn’t help you get your daily required dose of Biotin, Which results in hair thinning, hair fall and early hair greying. 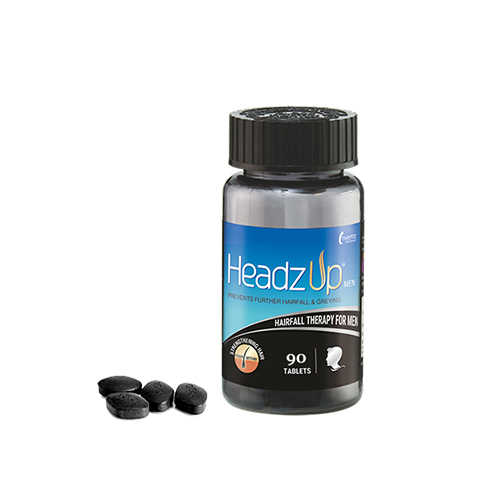 HeadzUp is a Biotin supplement tablet with other essential hair growth vitamins. Trichologists and dermatologists across the globe recommend the ingredients in HeadzUp as safe and effective. This product is really good. Works well for me. Came across this product in a pharmacy shop near my home and tried it for 3 months. Results are stunning where I could see my hair fall has dropped drastically. Doctor asked me to take biotin regularly for my brittle nails. I noticed my hair gets thicker like before. Is it side effect or main effect? Bought this product from my dermatologists. No effects during first few days, but now I’m able to see the differences after using it for couple of months. Change promotion guys. Your tablet is good but Why only hair? Why hide other benefits of Biotin on skin, nerves and nails. You can rethink. Its not for me, I’ll stick to my dermatologists. Did used for a month but having tablets doesn’t give me confidence. I take daily. Suits my purse. Don’t increase forever. Funny side, with your Headzzzup Black tablets my white hair grows too @63. Purchased for the first time. Should do as promised. Will wait for 3 months for results. Used the product. It’s a good product consuming as tablet made it easy for me. Have not tried any supplements so far. Headzup is the first one. Consuming each tablet per day, hope will have some improvement. Not 90 days but it took 6 months for me to see visible change. Growth is better, can or should I continue further? As a dietician, I do agree with the products benefits but I couldn’t get the product in my area to refer to my customers. Hope you are working on the same.